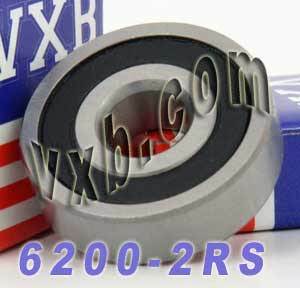 6200-2RS Sealed Ball Bearing. The inner diameter is 10mm, outer diameter is 30mm and the width is 9mm. Bearing is made of Chrome Steel. 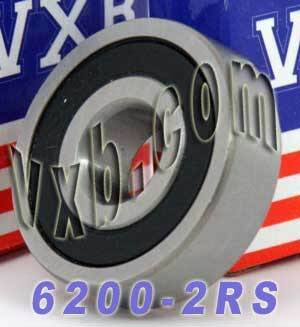 Each bearing has 2 Rubber Seals to protect the bearing from dust or any possible contamination. The bearing is pre-lubricated with grease. Seem fine, just haven't gotten around to installing them yet. Replacements for a Harbor Freight horizontal band saw. BUT NOT for all HF horizontal band saws. Installed four of these bearings on a decorative garden windmill that originally came with sleeves that had worn down. The bearings fit perfectly, I locked them in place with a dab of JB Weld and the wind mill is better than when it was new. Selecting and ordering this bearing was fast and easy with the on-line catalog. Payment was easy, and the price was great. The bearings I ordered came faster than I hoped, and I installed the bearings without any problems or surprises! What could be better? Easy to locate on internet and ordering was quick. Delivery was much faster than anticipated. These have worked great for my roling shelf.